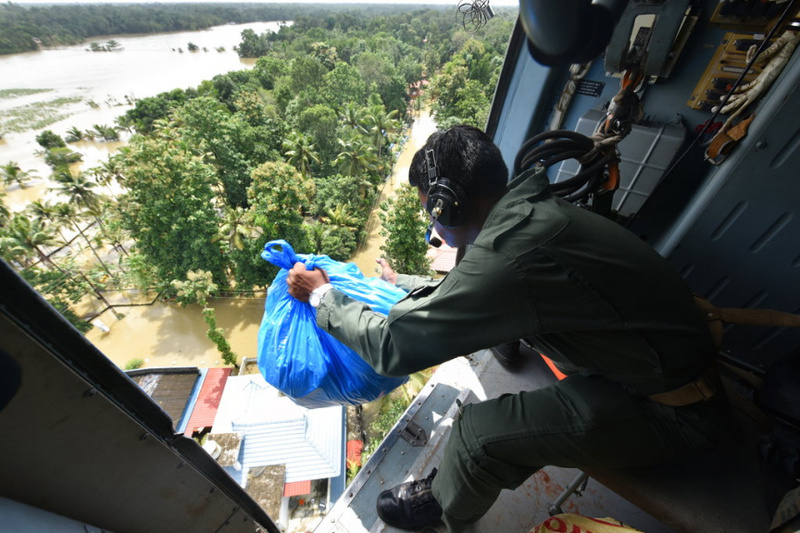 ALAPPUZHA, India (AP) — The Indian military opened an air base to commercial flights Monday in the flood-ravaged southern state of Kerala to help speed in relief and fly out residents. The first flight landed Monday morning at the naval air station in the city of Kochi, where the commercial airport has been closed for nearly a week. The Air India flight came from the city of Bangalore in the nearby state of Karnataka, Suresh Prabhu, the minister of civil aviation, said on Twitter. Kerala has been battered by torrential downpours since Aug. 8, with floods and landslides killing at least 250 people. About 800,000 people now living in some 4,000 relief camps. Thousands of people are taking shelter in small camps in the coastal town of Alappuzha. Many are in schools, but at least one is on the grounds of a mosque, where Christians, Hindus and Muslims have all found food and a place to sleep. The town itself, which is on slightly higher ground, has escaped the worst of the flooding, but the situation is far more grim just a few kilometers (a couple miles) away. "The water came almost up to my head," said Ullas, a 48-year-old man who uses only one name, and who fled his village for the safety of the town. He has no idea when he'll be able to come back. "We don't know," he said, as he helped distribute food in one relief center. "It could take a month." Thousands of people have been saved by the state's fishermen, many of whom headed into the floodwaters to help. On Monday, the state's top official, Pinarayi Vijayan, announced the government would pay those fishermen about $50 for each day they helped and also pay for repairs for boats damaged on rescues.